Carson Wentz watches as the Eagles struggle early in Sunday's loss to the Bucs. TAMPA, Fla. – Thank you, Nick Foles. You were outstanding in the playoffs last season. You helped the Eagles win their first Super Bowl with a MVP performance. You stepped in again as the backup quarterback in this season's opener and did enough to claim a victory. And while you didn't play your best in a 27-21 loss to the Buccaneers on Sunday, you battled until the end. You never complained about your peculiar situation over the last nine months. And for your grace and the memories you forged, you will have a place in the hearts and minds of Eagles fans everywhere. But it's time for Carson Wentz. The Eagles expect Wentz to return in time for Sunday's game against the Colts, NFL sources said. He must still be examined Monday and cleared for contact, but indications are the starter will be deemed ready and the team will finally give Wentz the green light. Doug Pederson declined to address Wentz's status after the game, only to say that he would "talk more about it probably tomorrow." It's unlikely that the Eagles' lackluster showing at steamy Raymond James Stadium will have any bearing on the decision. The same should be said of Foles, who struggled throughout the contest, even if his numbers were impressive on paper. Nick Foles does his best to shake off Tampa Bay’s Jason Pierre-Paul late in the game. Wentz is the franchise. He was arguably the NFL's MVP before tearing the ACL and LCL ligaments in his knee in December. And he has the ability, barring further injury and some unforeseen setback in his development, to one day become the league's best player. He will make the Eagles better. But he won't rescue a team that has yet to gain its footing on both sides of the ball, particularly on offense, and a team that continues to be bitten by injuries. "If and when Carson comes back, he'll add a spark," tight end Zach Ertz said. "He's one of the best players in the league. But we can't expect him to just put a Superman cape on and be his old self. He's going to be rusty." 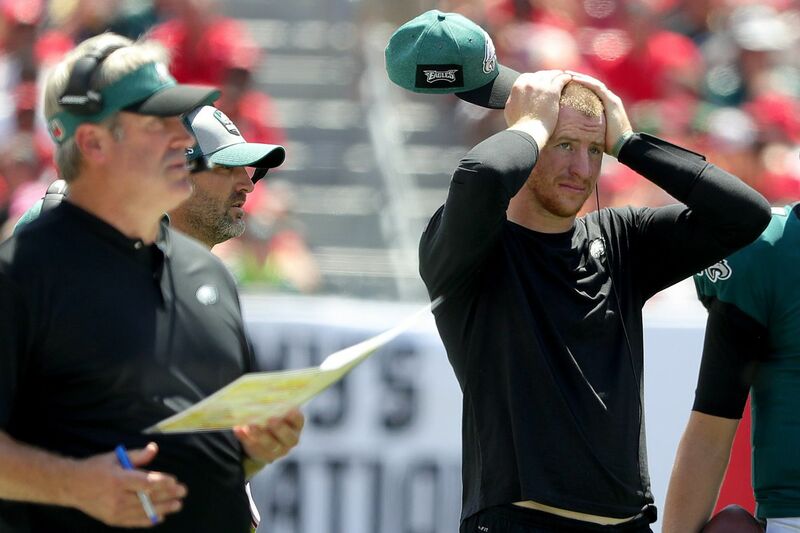 Wentz has practiced since May, participated in team drills in late July, and while the Eagles held him back for the next three weeks, he split first team repetitions for the last two weeks of the preseason. The distribution of snaps might have been responsible for Foles' slow start, but it was done with the big picture in mind. And to keep the competitive Wentz engaged. He was relegated to scout team the last two weeks, but his teammates said that his focus hadn't lessened. "He looks the same," tackle Jason Peters said. "But you don't know what you're going to get coming off an injury, just like they didn't know what they were going to get with me." If it were up to Wentz, he would have played Week 1. He stated that as his goal, but the team probably should not have allowed him to announce it in January. It set a deadline and created unnecessary questions when he wasn't cleared. A soft return date would have lessened expectations. The same thinking should apply to how he initially performs, as Peters, who came back from an ACL tear, suggested. It typically takes about a year for an athlete to regain full strength in his knee, and Wentz is just over nine months since surgery. But will he be less aggressive? Being aggressive is his nature, but he just might not be able to attempt some of the derring-do from last season. Would that make him less effective? So many of his greatest moments from 2017 came when he pulled off the unthinkable. Wentz has the skills, however, to be as good from the pocket. He has the arm strength and the mind, and his accuracy should only improve. There were several moments in Sunday's game when the Eagles could have used a quarterback with those abilities. Foles was hardly the most at fault. There were multiple penalties early in the game. There were multiple injuries. The Eagles were already without receiver Alshon Jeffery and running back Darren Sproles, but receiver Mike Wallace left with an ankle injury, Peters went out with a quadriceps strain, and running back Jay Ajayi was in and out of the lineup with a back issue. There were plays when the skill positions were filled by running back Wendell Smallwood, receivers Kamar Aiken and De'Andre Carter, and tight end Joshua Perkins. But that's not an excuse. "He's worked with those guys before," Pederson said. Foles' early throws were a touch off. He made Aiken stretch for a pass. He threw behind Corey Clement on a screen. He was late to pick up an A-gap blitz and fumbled. He held the ball a smidgen too long on plays when his first reads weren't open, contributing to the Bucs' three sacks and 12 hits. And he didn't audible when the Eagles had the wrong played called for a coverage, something Wentz was adept at last season. He also missed open receivers on a few plays, the costliest, on fourth and 10 in the fourth quarter, when Ertz was open on a corner route. Foles did plenty well, and he needed more help. Ertz was stopped short on a key fourth-and-4 early in the second half. The defense allowed two 75-yard touchdowns. "You saw his resiliency," Pederson said of Foles. Foles is a gamer. He's like a trusty, old pair of socks. "Obviously, stepping into the huddle and playing the game — it's something that I love," Foles said when asked about the possibility of Wentz's return. "It's a crazy sport . … Whatever the team asks from me any time, I'm going to be there, and I'm going to help in any way possible." No one would expect anything less.